The Swedish want the 2015 Volvo XC90 to be one of the safest cars on the market. 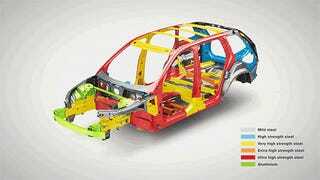 That's why the new car has run-off road protection, auto braking at intersections and about 40 per cent of its body made of ultra-high strength steel. Talk about a cannonball that seats seven. Committing to safety is not about passing a test or getting a ranking. It is about finding out how and why accidents and injuries occur and then developing the technology to prevent them. We lead, the industry follows. Damn right. And to make sure the industry will have some catching up to do, the 2015 XC90 comes with a system that keeps the car from going off the road. Volvo says half of all traffic fatalities in the United States are road departure accidents. The 2015 XC90 is also the first car in the world with automatic braking if the driver turns in front of an oncoming car. That's what my Autobianchi should have had back in February. There's also rear-impact detection, protective seats, safety belt pre-tensioners in all three rows, blind spot coverage and all the radar-based auto brake and auto steer functions that can come handy in city traffic. Add a body made of light but super strong boron-steel alloy to the mix, and what you end up with is Volvo's safest car ever. Oh, it will also have power. Quite a lot. I don't like SUVs, but I'm starting to fall for this one, that's for sure.